Cans and Tins, Oh My! Saw someone post on Facebook “What do you call these?” in relation to Pepsi, Coke etc. Of course what they were looking for was Soda, Pop, Soft Drink, etc. 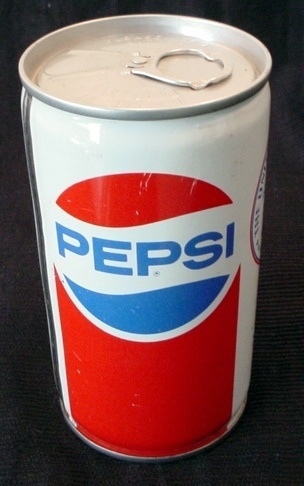 But someone (Jim Pottle) had replied “Cans” – and that brought to mind that we actually never used to call them cans back home when I was small, we called them tins. And we never called it soda, or pop, we called it drink. I can remember it well, going to the store and getting a tin of drink. What kind of drink? Pepsi, of course! I can only assume we called it tins because the cans were actually made out of tin. And remember that pull tab? How many broke off, and we’d try to ply it up with a key, or knife. And of course they were as sharp as hell (remember the do not lick the lid on pudding “tins”?). I’m sure we’ve all likely cut or at least nicked our lips or tongues on them at some point or another. And I remember the contests, always printed on the bottom of the tin. We’d have to cut it out with a can opener to turn them in. I wonder how many sticky can bottoms I’ve carried up to the old drugstore (the one in the old shopping center, on the end, Pizza Delight was there after). That reminds me of the old old drugstore, by the fork in Clarenville where Marine and Memorial split. But that’s another story for another day.